Cardinal Malcolm Ranjith by virtue of being President of the Catholic Bishops Conference is the head of all Bishops & representative of all Catholics in Sri Lanka. We would therefore like an explanation for two incidents that have occurred in August & September 2018. 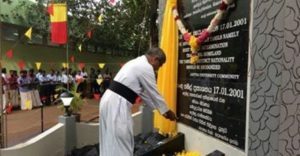 First was the public demonstration headed by a Catholic priest against Sinhalese being given land deeds in the North & the second the official unveiling of a commemorative plaque for LTTE pongul Tamil inside the Jaffa University again by a Catholic priest. So why is Jaffna University a state university with staff salaries paid by the tax payers commemorating a banned terrorist movement inside the university premises. Shouldn’t government be taking immediate action against them? These are all violations of the Constitution (6th amendment) and the Penal Code section 120. When Church fathers led demonstrations against Sinhalese returning to live in North Sri Lanka organized by a movement called Anti Mahaweli Tamils’ Heritage Forum led by Rev. Father Leo Amstrong. 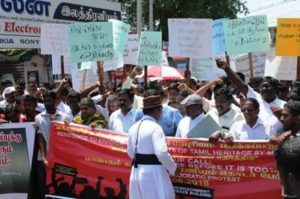 Thousands had participated against giving land deeds to Sinhalese in the Mullaitivu district. There are even rumours that many of these protestors were brought in from India. These are seriously allegations and require a proper investigation though it is pointless requesting it from a government that does nothing against violations by their own government in particular when just days earlier under instructions of MP Sridaran an archaeological site in Kilinochchi was bulldozed. Does reconciliation not include Sinhalese & Muslims? Were Sinhalese & Muslims not chased out of their lands & homes in the 1980s by the LTTE…..how can LTTE or Tamil separatists declare and demand that ONLY they live in the North or East AFTER chasing out Sinhalese & Muslims and not allowing them to return. Where is the fairplay & justice. What kind of sham reconciliation and peace is it to only look into the interests of one minority completely ignoring other parties that were victims too and for no fault of theirs. These innocent victims were farmers, villagers, children, babies & people who had done no wrong to LTTE or Tamil separatists. But their lives were cut short, their families remain mourning their dead but no foreign envoy, no UN, no UNHRC not even Sri Lanka’s own so-called rights activists are bothered to look into their plight. Is it because no one is paying them in dollars & sterling pounds that they are not bothered about their plight? All the rhetoric on reconciliation & peaceful coexistence mean nothing if a handful of people are given freedom to create animosities & tensions by their action and authorities do nothing against them. Those that represent these trouble makers cannot point fingers at the reaction completely ignoring the actions that have led to the reaction. We are generally in unison that the ordinary people of all ethnicities & faiths have cordial relations with each other but we are very saddened by the fact that it is the representatives of these ethnic groups & faiths who are drumming the animosities or planting the seeds to create such & these incidents in no way can be brushed aside as isolated incidents. We can list out pages and pages of instances where Church fathers have aligned with LTTE separatism and Bishop Rayappu Joseph & Father Emmanuel are living examples of such with neither the Church heads in Colombo or the Vatican taking action against them for promoting separatism & a terrorist organization. Every time it is ONLY the majority Sinhala Buddhists who are issued demarches & ridiculed and humiliated completely ignoring these acts & it is time that we call a spade a spade & a statement is issued by the Cardinals office apologizing to the country for these Catholic priests taking part in separatist & terrorist initiatives. In the meanwhile the Government of Sri Lanka cannot ignore that a state university has been regularly using the state property, state assets to hold separatist programs inside the university. This is a violation of every act of decency and unacceptable for the supposed educated academia to be garlanding murderers. 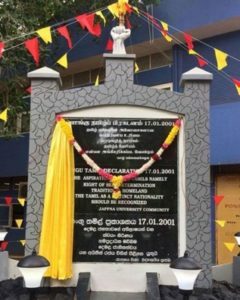 The University Grants Commission & Sri Lankan Government must take immediate action against the Vice Chancellor and all staff involved in this commemoration & completely ban the university from being used for any LTTE separatist ideology promotion. LTTE remains banned in Sri Lanka. The truth is the Sri Lankan Church is divided (just as the nation after 13A and the society). Tamil bishops don’t recognise the leadership of the Sinhala archbishop. They want Tamil Eelam so they can also be archbishops. So it is worthless taking this to the Archbishop. Faulting him only worsens Sri Lanka’s sorry state of affairs. When the Pongu Thamil declaration was made on 17/01/2001 the government didn’t make it illegal. Who were in that government? The words have been chosen to avoid criminal liability. Tamils (and anyone else) have the right of self determination. This cannot be blocked. The only way to counter it is to present Sri Lankans’ right of self determination (which clashes with Tamil right of self determination). Traditional places of Tamil habitation has been accepted by Sri Lanka since the Indo Lanka Peace Accord. No leader has rejected it. Tamil nationality is a tricky one but until recently Sri Lanka used nationality in place of ethnicity. wickrama Sinhala killer gave its fullest support to its catholic buddy hitler mala paharan. UNPatritoic_rats and the catholics since it was a major Sinhalese cull! Did the Sinhala modayas understand? One sweet lie from Batalande Wandakaya, most Sinhala modayas start licking [email protected]_leech’s backside. gave their blessings. Drealam in any form or shape! That’s these guys’ manthra! where all the media are headed by Asinhalese! All these are no secret to tamils, mussies and catholics. Sinhala modayas? They have no clue. Shenali how long are you writing and how many interesting and valuable articles have written by you concerns our motherland and it’s people but is it worthy with our current and past political stooges around? Do they listen or read these article’s? Do they have the knowledge to understand what’s written in your long very useful article’s? Maybe few understands not everybody because they are not educated nor have any interests on such topics at all. They are all dumb and dumbbers. sympathisers. Spineless leaders and the spineless terrorist government damn care about our country or the security. People in this country are powerless and afraid to do a anything because of tough police tactics and jailing innocent people. They are more worried about their survival from starvation, water,housing and jobs. People are praying and crying to see the end of this suffering. This yamapalana yamaballo one day has to answer before they all go to hell for making our country a beggars paradise. This entry was posted on Wednesday, September 19th, 2018. You can follow any responses to this entry through the RSS 2.0 feed. You can skip to the end and leave a response.